As it happens, my recent Buz Swayer find coincided with that of Wash Tubbs. Both by Roy Crane, not quite ten years apart. (At least, the specific strips I read were less than ten years apart.) The Wash Tubbs reprints I came across were in Dragon Lady Press #7, pictured at right. The difference between the two strips, to me, was astounding. 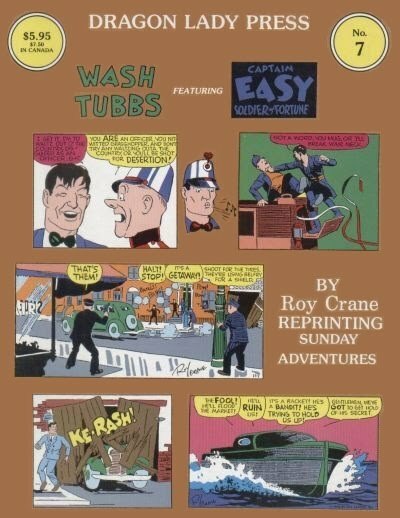 Just about everything I didn't like in Buz Swayer was completely absent in Wash Tubbs. The art was consistently styled throughout the strip, regardless of what was being drawn. The characters still displayed attitudes consistent with the time period, but not not spitefully so. The plot is generally just a straight-on adventure series without a lot of deep characterization. Captain Easy is a hero/adventurer just because he is. He gets into fights and chases. There's a loose plot to follow, but motivation is pretty lax, as you would probably expect from any piece of pop culture fiction from that time period. It's a little like watching Indiana Jones and the Temple of Doom -- lots of action and face-paced adventure, but it doesn't make a whole lot of sense if you sit down to think about. I don't mean that in a disparaging way. It's not the type of thing I'd want to read long-term, but it's something of a palette-cleanser after reading a bunch of small, indie books that are trying to be or actually are deep, reflective and self-important. What I read did a little to redeem Roy Crane for me. That Buz Sawyer stuff was really just... wrong, but Wash Tubbs holds up a lot better and I can see why that strip lasted as long as it did.